The Romanian Institute for Human Rights (RIHR), an independent body with legal personality, established under the law - Law No. 9/1991 -, is the first national human rights institution created in Romania after 1989. By establishing this body, the Romanian authorities responded at the time to the preoccupations of the United Nations Organization, the Council of Europe and the Organization for Security and Cooperation in Europe which, in many resolutions and recommendations encouraged the creation and the development of independent national human rights institutions with special powers to promote and protect human rights also by other means than those belonging to the judicial. The creation of the Romanian Institute for Human Rights was meant, on the one hand, to fill the gap existing at that moment between the legal provisions and human rights militancy and, on the other hand, to provide a smoothing interface between the State’s structures and the civil ones by means of an institution capable of cooperating with both. The Institute is member of the European Network of National Human Rights Institutions, of the Francophone Association of National Human Rights Commissions, of the European Law Institute in Brussels, and of the International Institute of Law of French Expression and Inspiration. Throughout its whole evolution, RIHR pursued compliance with the Paris Principles formulated in 1991 by the Conference devoted to national human rights institutions. The Paris Principles, which became an official document of the United Nations General Assembly in 1993, refer to an “as broad a mandate as possible” based on the universal standards of human rights an including the double responsibility of promoting and protecting human rights, while covering all the rights; they should be independent from the government, their independence should be guaranteed by the Constitution or by the law, they should be characterized by adequate power of investigation, pluralism including the structure of the personnel and/or effective cooperation, and adequate human and financial resources as well. At the same time, the Institute developed in accordance with the requirements of the Council of Europe formulated in Recommendations R (79) 16 and R (97) 14 and Resolution (97) 11 by the Council of Europe Committee of Ministers. While anchoring its preoccupations to the actual realities of each period, each stage, the Institute has always had in mind the creation of an adequate framework and adequate means for the actual application and observance of human rights, to better know them and be aware of them. In its activity, the Institute laid particular emphasis on programmes and partnerships that were likely to better respond to the international and the national requirements for the promotion of human rights and fundamental freedoms, for training those categories of persons responsible with the protection thereof. Collaboration with public institutions, the academic community, non-governmental organizations taking interest in human rights issues, etc., as well as the experience accumulated in time provided the Institute with increased abilities to take action, so that it should be able to fulfil the powers and the duties conferred by Law No. 9/1991 in its capacity as independent national institution protecting human rights, the Institute becoming gradually an interface, a bridge between the State’s institutions and the civil society. Thus, in September 19914, the United Nations Centre for Human Rights in Geneva (which was to become the Office of High Commissioner for Human Rights) and the Government of Romania signed an agreement on the implementation of a three-year specialized technical assistance Programme. The Programme was accomplished in the autumn of 1994 and was appreciated as “the first truly comprehensive programme of advisory services and technical assistance undertaken by the Centre for Human Rights”. 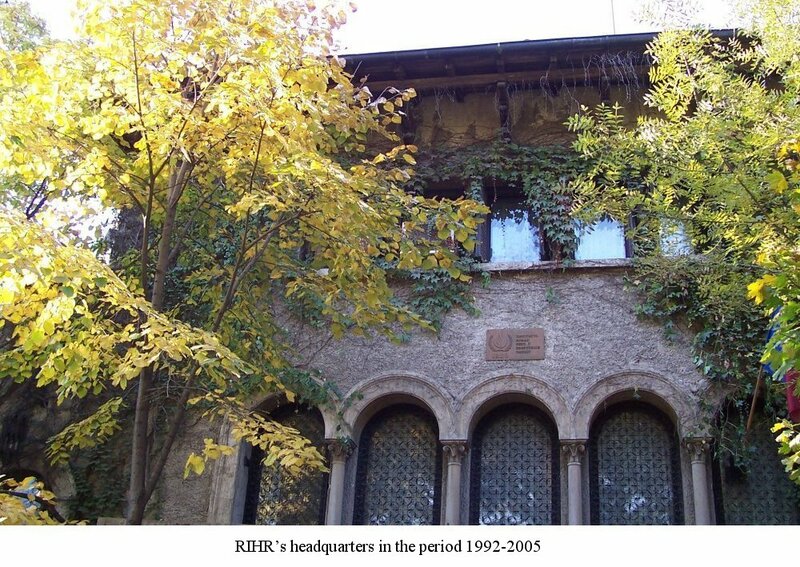 Although the initial plan had designated RIHR as the addressee of some of the Centre’s assistive activities, from the very beginning the Institute assumed the role of partner and co-organizer, and was regarded as such by the United Nations Centre in Geneva. Between 1992-1994, eight series of courses adapted to the special needs of various professional groups were organized as an integral part of this Programme. The included such cycles as “Human rights in the administration of justice” – six courses, “Teaching and learning human rights” – four courses, “The media and human rights”, “Human rights and the minorities issue”, “Prevention and resolution of conflicts between the citizens and the local administration”, “Rights of the child”, etc. The beneficiaries of these courses were judges, prosecutors, lawyers, staff of the police and of penitentiaries, primary school and higher level teachers, representatives of the central and the local administration staff, journalists and representatives of non-governmental organizations taking interest in the field of human rights. As the United Nations Commission’s on Human Rights Report on the evaluation of the Romania Country Programme of Advisory Services and Technical Assistance in the Field of Human Rights appreciates, “IRDO has been the Centre’s local partner, acting as unofficial contact between the Centre and Government officials and agencies, supplying logistical support, issuing invitations to participants, recruiting local experts, translating and distributing programme materials, providing premises and interpretation facilities, and so on. ...It is clear that, without its support, the programme would not have advanced as effectively as has been the case”. In the following stages, the volume of the training-for-trainers activities increased considerably, and the Institute started organizing intensively courses first at area level and then at county level. At the same time, RIHR initiated other courses as well, with such topics as “Human rights in action”, “Women’s rights”, etc. A parallel evolution was the International University of Human Rights, initiated and coordinated by RIHR, whose annual courses enjoyed a large and representative participation from the very beginning. The activities performed by RIHR have been complex ever since the Institute was established. An important aspect in the orientation of the Institute’s scientific activities was the initiation of researches on various aspects related to the promotion and protection of human rights in Romania and at international level. In this respect, the research work has been particularly directed towards the national and the international rules, towards institutions and bodies, dealing with various categories of rights, general and special ones, as well as the progress scored with the observance thereof. All this work resulted in the following palpable achievements: presentation of works at national and international colloquia, consultative reports on the legislation, including opinions about the extent the adopted laws were consonant with the international standards, etc. Also, as soon as it was established, the Romanian Institute for Human Rights organized seminars and symposia with national and international participation, trying to get involved all the governmental and the non-governmental actors having responsibilities and an taking interest in the field of human rights, with a view to implement or find new solutions for improved awareness about and better observance of human rights in Romania. So far, the Romanian Institute for Human Rights has organized or participated in a large number of events. These included, among others, the colloquium on “The reform of the international institutions protecting human rights”, organized by RIHR in Bucharest on 15-17 March 1993 and appreciated by the United Nations as a preparatory reunion of the World Conference of Human Rights of Vienna (A/Conf.157/PC/42/Add.8/27 April 1993). Also a large and representative participation characterized international scientific reunions devoted to such topics as “International adoption in the European countries”, “Tourism and human rights”, the first seminar on this topic in the world, whose conclusions and recommendations, included in the adopted Declaration, were submitted to governments and international organizations, and “Didactic methods and means for the teaching of human rights”, etc. Based on a rich documentation, the Institute elaborated a first draft for the Advocate of the People Act, an institution with an essential role for the defence of human rights, and then organized in Bucharest, together with the Council of Europe, on 1-2 November 1993, an international symposium that enjoyed the participation of Council of Europe experts, representatives of the Ombudsman institution from Spain, Denmark and Poland, as well as parliamentarians, politicians, magistrates and scientists. The first draft elaborated by the Romanian Institute for Human Rights together with the comments made during the symposium were adopted by a group of deputies who, based on them, submitted a bill on the Advocate of the People institution to the Standing Bureau of the Chamber of Deputies. Also, on request by Parliament’s Committees, RIHR performed research activities, supplied documentations that had been requested and expressed viewpoints on several bills in the field of the civil and the penal legislation. In order to inform public bodies, non-governmental organizations and the citizens, RIHR elaborated and published a large number of volumes and brochures – courses, research works and documentations, including translations of international documents, periodicals as well as reports on the progress scored with the observance of human rights in Romania and reports on the Institute’s activities. Of these, let us mention by way of example quarterly “Drepturile Omului” (Human Rights), which includes studies, researches, articles, documents, jurisprudence of the Constitutional Court of Romania, of the European Court of Human Rights, with abstracts in English and French; beside the quarterly, mention should also be made of the works published in volumes, some of which in bilingual or even trilingual editions, such as “Drepturile omului în acţiune” (Human rights in action), “Cadrul legislative şi instituţional pentru minorităţile naţionale din România” (The legislative and the institutional framework for the national minorities in Romania), “Drepturile omului – Societatea civilă – Democraţie parlamentară” (Human rights – Civil society – Parliamentary democracy), “Seminarul internaţional OSCE asupra toleranţei” (The international OSCE seminar on tolerance), “Şanse egale, şanse reale” (Equal opportunities, real opportunities), “Minorităţile. Statut. Perspective” (Minorities. Status. Prospects), “Principalele instrumente internaţionale privind drepturile omului” (The main international human rights instruments), “Protecţia juridică a drepturilor omului” (The legal protection of human rights), “Repere pentru o filosofie a drepturilor omului” (Landmarks for a philosophy of human rights), to mention only a few. A parallel development is the Documentation and Information Centre in the field of human rights that has been created and is functioning within the Institute. This considerable inventory of books and periodicals includes, beside volumes and other publications referring to the international and the national rules and mechanisms, a number of fundamental studies in the field, which makes it attractive for beneficiaries belonging to all age groups and interested in human rights issues. A great many of these publications come from donations made by the United Nations Centre in Geneva, UNESCO, Canadian representative institutions, University VRIJE of Brussels, the Institute of Comparative Law in Lausanne, which at the same time offered specialized assistance with the organization and the classification of the library, the Canadian Foundation of for Human Rights, institutes or scientific centres with similar orientation from other countries, etc. The Institute’s activities enjoy the constant appreciation, collaboration and assistance of several Romanian and foreign personalities in the scientific, political and cultural life, representatives of non-governmental organizations. The Institute’s activity has been awarded in the course of time with several national and international prizes by such institutions as the French National Consultative Commission on Human Rights, the Union of Jurists of Romania, the Mediation Council of Romania, etc. The Romanian Institute for Human Rights plays an important role and makes an obvious contribution to the promotion and protection of human rights and fundamental freedoms through its training, informing, researching and consulting activities performed in all these years. In this long-term effort, the Romanian Institute for Human Rights has been given a specific mission that can only be accomplished in partnership with the State’s bodies and with the non-governmental organizations.